Revenge is a dish best served cloned. 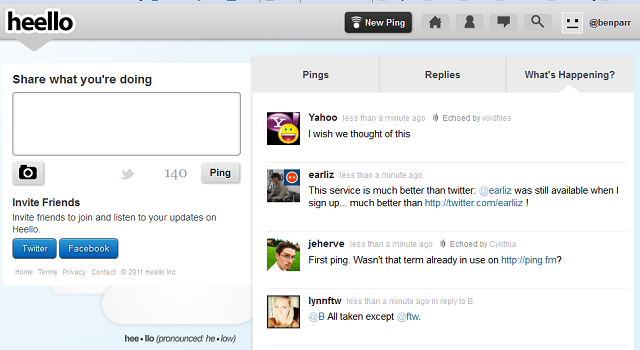 Twitpic founder Noah Everett has unveiled Heello, his feature-for-feature copy of Twitter. The move comes just a day after Twitter completed the rollout of its photo-sharing service — a direct competitor to Twitpic. Heello looks and acts like Twitter in almost every way. Instead of tweeting, users send “pings” to their followers. Instead of retweeting, users “echo” other posts. And instead of following, friends “listen” to their friends. The only real difference is that updates appear in a user’s stream in real-time, which is quite annoying if you want to click on something in a friend’s tweet. And if that weren’t enough, Heello boasts Twitter and Facebook integration, so your Heello posts can still go to your other social networks. It also includes a real-time feed of all public activity, which currently contains a number of fake accounts claiming to be CNN, Tumblr and Mark Zuckerberg. The clone seems more of a publicity stunt than a real business. Twitter blindsided Everett when it launched a feature that was directly competitive to his company, and this may be payback. Nevertheless, Everett told VentureBeat that Heello will soon support video, checkins, SMS integration, mobile apps and a “Channels” feature that works much like Twitter Lists. Much as we love new social media services at Mashable, we’re not sure what to make of Heello. If Everett was looking for some attention, well, mission accomplished. But his service will have a tough time gaining traction against Twitter, and its 200 million registered users, without any truly innovative features. Then again, if there’s one skill entrepreneurs have, it’s the ability to charge ahead with blind optimism, even when the numbers are against you.